What makes a full-service wedding flower package special? Since every couple is unique, we work with you to build a customized wedding flower package based on your wish list and tailored to your wedding venue. We will prioritize your must-haves and work in any extras to put the finishing touch on your day. Finally, delivery and set-up is always factored in because full-service means more than “just flowers”. If you envision a dramatic arbour or arch, stunning statement arrangements, delicately placed foliage, or a floating floral installation, the full-service option is for you. You want wow-worthy florals to be your main decor element and you know that you’ll need a pro to coordinate and execute set-up. Starting at $3,000 for weddings in Hamilton and $3,500 for weddings in Toronto, Niagara + Southern Ontario during the high season (May-October). Depending on time of year, we can sometimes accommodate lower budgets for full-service weddings especially if you are having a more intimate event. If your budget is close, feel free to reach out! Personal flowers – These are any floral arrangements that people will carry or wear during the ceremony and reception. Usually couples prioritize bouquets for the bride and bridesmaids and boutonnieres for the groom and groomsmen. 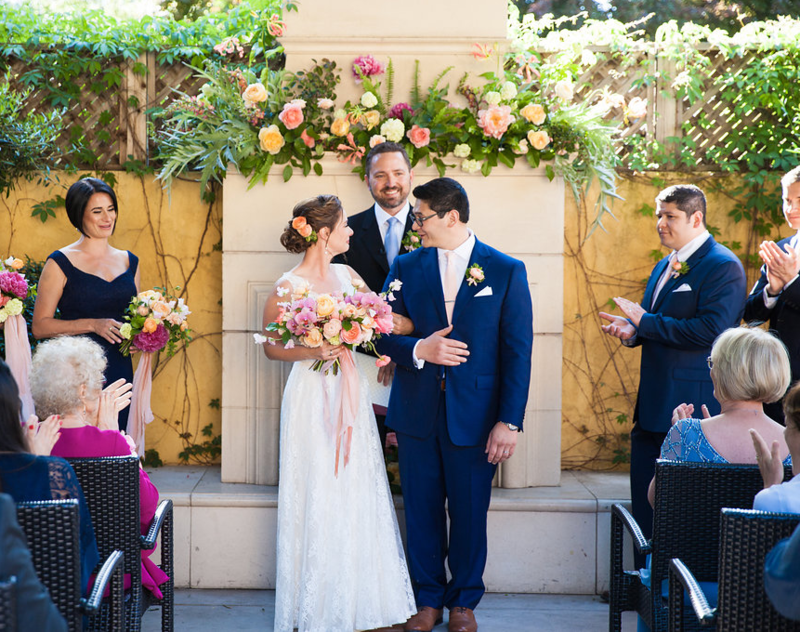 Ceremony flowers – You can add a touch of flowers to accentuate an already beautiful wedding venue, or if your venue is more minimal, you might splurge on a dramatic floral backdrop to set the stage for your ceremony. Couples often opt for a set of matching urns, a floral arch/arbour (rent one of our structures or supply your own) or a single large arrangement to sit on an altar. Reception flowers – We encourage couples to prioritize centrepieces for their guest tables, but there are many other ways to enhance your reception with fresh flowers. Customized wedding flower packages for various tables often include low floral centrepieces, sets of bud vases or candles, garlands with or without flowers tucked in. We can also use an assortment of floral elements to create unique tablescapes. These are some areas to consider adding flowers to enhance your wedding day. You might want to add a few more personal flowers to honour special guests or you might want a more unique approach to decorating your ceremony space. Check out some of our favourite wearable flowers here. Extra flowers to add to your sweets table, the bar or to spruce up washrooms.